Somehow Sew Grateful Week snuck up on me. So, I've decided to do just one post, since it took me all week to decide what to say. I'm not usually sentimental, so please bear with my lack of eloquence. On Tuesday, I had dinner with Puu and Oona after a seminar on working with leather that was lead by Kenneth D King at Mood Fabrics. (We'll circle back to the multilayered awesomeness of this statement in a minute). And we were talking about how - unlike some other on-line communities - we've all found the sewing blogosphere to be overwhelmingly accepting and supportive, with very few exceptions. The first person to follow my blog who I didn't know in real life was about as different from me as another woman could be, separated by geography, age, race, religion, cultural context, preferred hair color ;-)... but I've always felt that there is a mutual sense of respect, encouragement and appreciation between us. I feel this across the wider sewing blogosphere: that we are all living the lives that we've either chosen or have been dealt, but that our shared experience - sewing - cuts across the differences and judgements that might otherwise separate us. There are people in my virtual life who I would never encounter IRL, but that I feel a kinship with. And I am immeasurably grateful for that. A few months ago a friend said to me about herself "I'm an odd duck. Not everyone likes my quack." I've often felt the same way. I quack too loud, say the wrong things, am prone to dropping/breaking/slamming/spilling/tangling, and I have two left feet. I'm prone to loneliness but have a hard time reaching out to others. I am terrified of heights and flight, but I brave both. Sometimes I can't decide what to wear and I don't know if that's because I'm feeling insecure or if I'm feeling insecure because I don't know what to wear. I have an alter ego. I crack myself up on a regular basis. I am not cool. The landscape of my imagination is populated with dragons and monsters and zombies, purple haired super heroes with magical powers and a tiny herd of knit elephants that trumpet and trample and trip over their own trunks. Blogging and sewing have helped me explore and embrace all of these parts of myself, and that has spilled over in a tangible way into how I feel about myself in the real world. I like my odd quack. And I am grateful for this - that I've found this shared space that we've carved out on the internet where I can quack my quack with duckling glee. I love that others of you also quack your own quacks on your blogs or in comments. Not only am I constantly inspired by what you sew, but I'm inspired by your journey and how you choose to share your creative life with me and others. I know what it's like to take a deep breath and click "publish", which is so much less safe than clicking "save". And I'm grateful for you - that you click "publish", too. So, back to the awesomeness of my first statement. New York is an amazing place to be a sewist. Not only do we have classes with people like Kenneth King and Susan Khaljie, and stores like Mood and Paron Fabrics, but we seem to have a growing community. In the last year, I've had opportunities to meet other sewing bloggers in person, thanks both to living here and traveling as part of my work life. 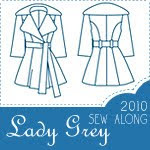 And so, in a very unexpected way the sewing blogosphere has changed my life. In a city of 8 million and a world of nearly 7 billion, I've found people - people who I really like - who understand what drives me to constantly make things. And since they seem to keep inviting me, I guess it's mutual. And I'm grateful for this. Lastly - and here is the segue - I'm glad to be part of a generous community. It's a rare day when there isn't a giveaway, a tutorial or even a helpful comment floating around in the sewing blogosphere. This week I received a very generous gift of fabric, yarn and patterns from another blogger, simply because we were talking about it. It made my day. And I'm grateful. 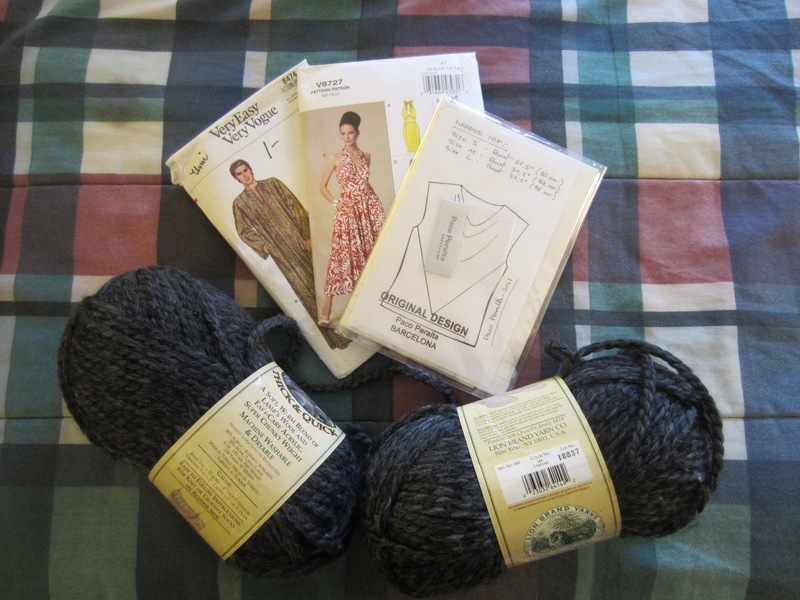 So, my giveaway, as I continue on my frosting diet is what I'm calling the Layer Cake Giveaway - four "cake" patterns that could be mixed and matched for multiple wardrobe options. I will probably never sew them up myself. 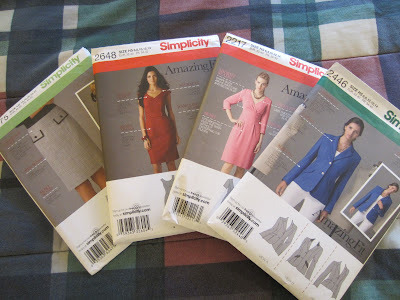 They are all Simplicity Amazing Fit patterns - a skirt, 2 dresses and a jacket. The give away is open to all, regardless of where you live. Just shout "Pass the Cake!" in the comments by midnight (EST) on Wednesday (Feb 13) and make sure that I have an email where I can reach you. If you'd like, you can tell me what your favorite kind of cake (including frosting!) is to double your chances. Have a wonderful weekend, everyone! We're expecting a blizzard in NY and my office is shutting early. So I will be hunkered down at my sewing machine. Pass the Cake! (Red Velvet, please). Thanks for the giveaway! Pass the Cake. Please let it me Caramel Cake. Thank you for this wonderful giveaway. Pass the cake! And my favorite is a delicious cheesecake my daughter makes on an all too frequent basis! But I want to hear about the class with Kenneth King and Susan Khalje as I live far from New York and can only live vicariously! "Quack, quack." Don't need any more cake right now, but what a generous gesture on your part! oooh, lemon and chocolate. This is an unusual combination, but definitely one that I could get down with! Pass the Cake please! but only if it's coffee and walnut please. Really enjoyed reading your blog! Thanks quacker. Pass the Cake and let it be Red Velvet with vanilla frosting yum yum! The sun is shining today in the UK and i'm grateful for that (tis cold though). Sounds like you like cake for breakfast! Mmmm.... I do, too. Oh! I'll write more next week. But no need to live vicariously - their on-line classes on Craftsy and other platforms are wonderful too! Chocolate! Pass the cake please! Very beautifully expressed and I feel much the same as you do. Can't wait to see what you do with the fabric! Please pass the cake and let it be spice with butter cream frosting pretty please! what a really wonderful post, clio! i actually teared up a little bit from identifying so much with how well you expressed your sense of odd-duck-ness. really wonderfully said. bravo!! I'm so grateful to have met you. You are a kindred soul and we have so much in common , I wish I lived closer..
We all waddle a bit, don't we? Thank you, Peter! It will be fantastic! Trust me. 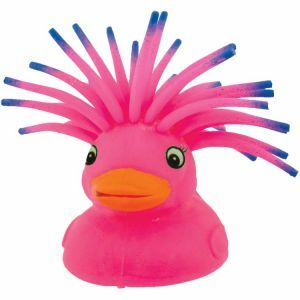 I love "odd duck with a quack that not everybody likes". That's a bit like me and at times it can be isolating and lonely but like you, I like me and so I don't change my quirkiness. I have only learned to self reflect and not be afraid of it and I am now the best me I can be and I hope to get better. 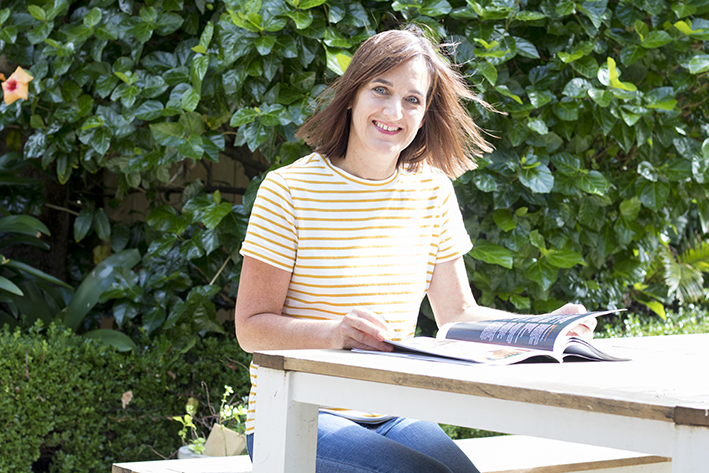 I am AMAZED that anybody follows my blog... it is a kind of mish mash of stuff and not enough sewing really but I too am grateful for the things I have learned from likeminded bloggers and a lot of it isn't even about sewing. Oh my favourite cake is orange poppyseed cake with cream cheese icing! Yum and in sewing terms "sparkly" love sparkles! Pass the cake! Especially if it's chocolate with butter cream icing! Please pass my favourite cake, chocolate chunk with chocolate ganache for icing. Pass the cake please! Chocolate mousse... or something fruity. It's never enough sewing, is it?!?!?! Pass the cake please! Something I say a bit too often - I just can't help myself!!! My favourite is sponge cake with freshly whipped cream, no frosting just a sprinkling of icing sugar. Thanks for this giveaway - these patterns are definitely cake and not frosting for me!! Hi there, what a wonderful post you wrote up. I nodded all the way through :) . Oh, and PASS THE CAKE! Chocolate cupcake, with buttercream chocolate icing. And sprinkles. Obviously. Lots of sprinkles. 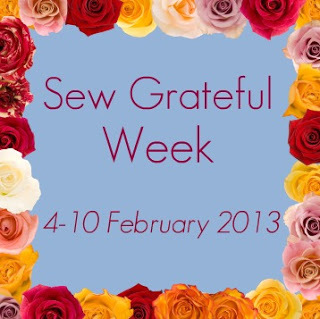 (And also feel free to drop by my blog and have a look, I'm having a Sew Grateful Week giveaway as well. www.gjeometry.com ). Quack!! Pass the cake ! - a mud pie cupcake for me - mmm. Pass the cake! And thanks for having he courage to press 'publish'. 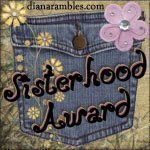 I love your blog, your sewn projects, and your quack. Also your hair color. Oo, pass the cake! Those are gorgeous. I love the ability of the Internet to let us odd ducks find each other. And my favourite cake is ice-cream cake. Especially DQ blizzard cake. Hmm, does that count? seriously, if that wasn't an eloquent post i don't know what is. glad to be waddling with you. Thank you, Mae! Let me know how to get in touch with you if you win! Pass the cake! 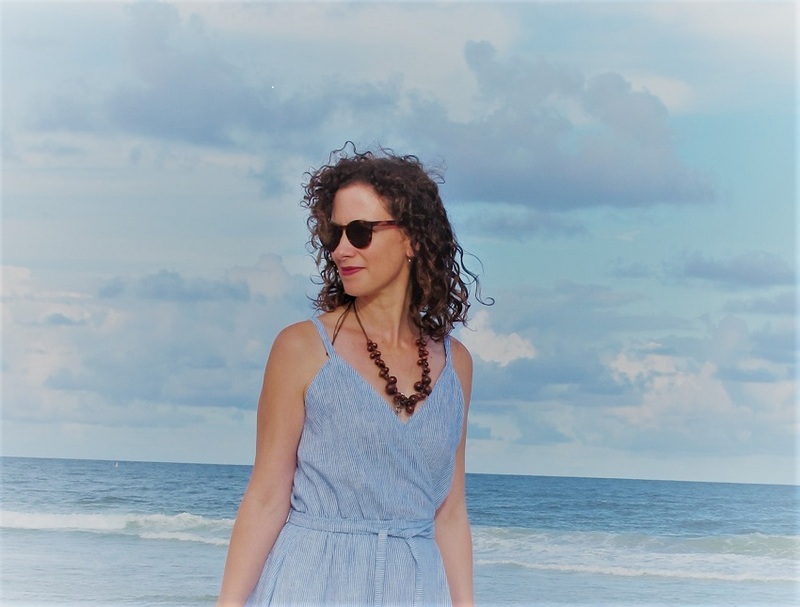 Terrific post and although I don't have a blog myself....but am more and more tempted each day....I so appreciate the support of other sewing bloggists. Anytime I've commented (or won!) the response has been so positive. I hope I win, I'll pull your patterns right into my Fashion Studies classroom. This is the first year Fashion has been taught at my school and we are slowly building resources. Good basics are a great starting point for my students. As for Cake....I love a good Tirimisu....layers of cake, coffee, pastry cream and whipped cream - YUM! Good luck through the storm - I'm in Alberta and while we've had snow (and lots of it) it's warmish enough today that I think Spring is coming. Pass the cake!! I think a fruit torte would suit me just fine. Loved this post!!! I am most definitely an odd duck, and am so happy to have the blogoddesses to quack along with. Sewing has been such a fun and rewarding hobby, and it's just going to get better. Hope you fared well through the blizzard. Here in central NJ we didn't do too bad, maybe 6-7 inches. Pass the cake! My favorite is zucchini cake with mascarpone icing. Thanks, Jodie! It's not for everyone, but if you can make the time and enjoy the "conversation", it is well worth it IMHO. Pass the cake! Ice cream cake, that is. Thanks! This is why I feel at home among the sewing blogsphere, too! It's lovely to be part of a quacking community where every quack finds it's place and adds to the harmony! I love this post. NYC and of course the sewing community is amazing in so many ways. Pass the cake (carrot of course). Pass the Cake! Fingers crossed it gets passed on to me. Pass the cake! I don't think I could choose a favorite cake... but my friend made a "salted carmel ding dong cake" for another friend's birthday last week and it was AMAZING. Chocolate cake with some sort of whipped cream layer in the middle and salted carmel hidden underneath chocolate frosting. I don't think I've ever consumed a piece of cake so fast. Pass the cake! Loud and saying the wrong things probably means you are being honest (and funny) lol, which is great in my opinion. Oh, and carrot cake with cream cheese frosting please! Pass the cake!!! I like odd ducks myself, they are the spice of life. My fave cake: lemon drizzle always wins the day!! Pass the cake. (Red velvet especially) I am at isidore256 and that is at gmail dot com. You are wonderfully eloquent! and Thank Goodness for people like you and for communities like this!! I feel often like I am watching from the fringes because I am not a blogger and I live in the boonies (actually the Berkshires). and yet I love how everyone shines so uniquely and how there is room for quirks and quackers and every last weirdy, delightful thing! Yay You!! Yay gratitude!! Thank you! I like your quack too! I love my hometown and my corner of the blogosphere. Thank you! It is, isn't it? Off key never sounded so good. Pass the cake! Particularly cinnamon sponge cake or lemon drizzle cake! What a fab bunch of patterns. oooh, I don't even know that kind of cake! I'm gonna have to google that. Pass the cake! Well, my favourite is quite simple, chocolate cake, with chocolate cream and chocolate frosting... maybe chocolate chips? I really do like chocolate!! Also, lovely post. I now have an imaginary herd of knitted elephants running around, so cute! You are in, Sveta! MMmm. Pies and crumbles are good too! Brownies are my very own personal kryptonite - I am helpless against their gooey powers. "Pass the Cake!" enter me please :) chocolate fudge is my fave - you can never have enough chocolate cake! What a thoughtful post-- I can relate to so much of what you say. And I could use that jacket pattern you're giving away-- please pass the cake! I love big layer cakes like chocolate and coconut. My favorite cakes I make myself don't tend to be frosted though, like poppyseed cake and cranberry upside down cake.